Eddie, a 13-year-old Pomeranian owned by Maria Puglisi of Gloucester, auditions Thursday for a part in the upcoming Gloucester High School production of "Legally Blonde." Four dogs auditioned for two canine roles. 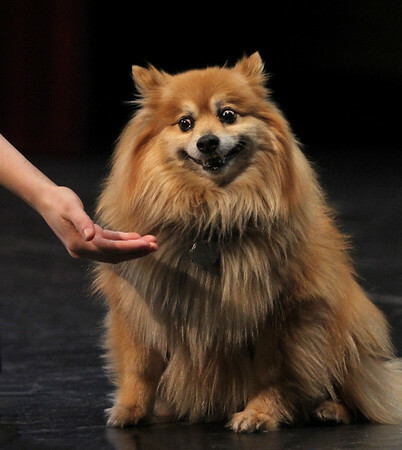 The lead role, Bruiser, is actually a "speaking" part, of sorts: the dog who wins the role will be called upon to bark on cue several times during each performance. In the movie the play is based on, Bruiser (the lead character Elle's dog) was played by a Chihuahua, and the other dog, Rufus, was played by a bulldog. For the GHS production, auditions were open to dogs of any breed, as long as they were 75 pounds or lighter. Theatre arts teacher Jessica Ruggles, who supervises the production, said the casting process was intentionally open to dog-owners outside the school. "I think it's a great way to bring together the larger Gloucester community with what we're doing," she said.